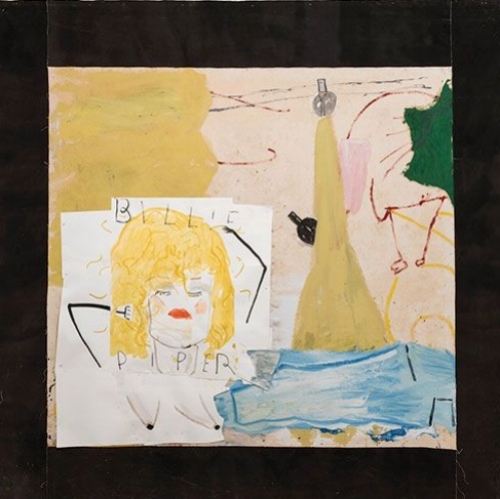 A recent addition to the New Hall Art Collection is Rose Wylie’s ‘Billie Piper’, which used to hang in the artist’s kitchen and now adorns the walls of the Murray Edwards College bar. The story of Wylie’s rise to fame is both unusual and wonderful. Wylie was almost completely unknown until 2010, when feminist academic Germaine Greer wrote an article in The Guardian entitled: ‘Who is Britain's hottest new artist? A 76-year-old called Rose Wylie.’ Since then, Wylie’s works have been exhibited in major museums and galleries all around the world. ‘Billie Piper’ is characteristic of Wylie’s spontaneous and anarchic style. It was first painted in 1994 to mark Wylie’s daughter’s wedding. When the marriage broke down, Wylie returned to the work, replacing her daughter’s face with Billie Piper’s and transforming the blue wedding marquee into a dress. Wylie described the painting as showing the fragility of relationships, a quality which is emphasised by the work’s unstretched and unprimed canvas, which looks dangerously close to falling apart.